« New Headquarters for W.M.S.A.R. After two weeks of glorious sunshine on Sunday the 10th of June, the 2018 Waterford Country Fair took place. 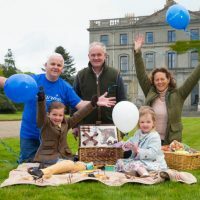 The fair was hosted by the Historic Curraghmore House and Gardens – a 2,500 acre demesne in Portlaw, Waterford. With a full and varied timetable of events that began at 10am and continued until 6pm the fair proved to be a huge success with all present. Curraghmore House and Gardens is the ancestral home of Lord and Lady Waterford and is the largest private demesne in Ireland. Along with its courtyard and gardens Curraghmore had ample space for the, in excess of 10,000, people and pets who attended the fair. It was a celebration of ‘country life and living’ the fair had attractions such as jousting, sheep dog trials and poultry displays. On entering the gardens there were various displays which included the Moon and Sixpence traveling Marionette Theatre. Their all ages version of Little Red Riding Hood also included a song about tidying rubbish away. On the lawns to the side of the house was an area set out for dog displays and competitions. There were many proud dog owners in attendance and before the competitions began there was a display by Fun Paws agility and puppy training. Once the competition was under way there was no shortage of entrants, with prizes and ribbons to be won by the best dogs. On the lawns at the front of the house there was a stage for live performances, a bouncy castle area, and a sprinkle of fairground attractions. The amenities included a hammock area for anyone who wanted timeout or to relax. From the lawns and across the lake was an equestrian area with a number of arenas for the R.D.S. Horseshow qualifiers that were taking place. These qualifiers included dressage, side saddle, and pony club games. In the courtyard there was the Skinny Chef Demonstration for the culinary enthusiasts, and for anyone who was hungry the courtyard was teeming with a myriad of artisan food stalls with a variety of foods on offer. So at €10 for adults and €5 for children it was great value, with all proceeds going to the Make a wish Foundation, the Waterford Country Fair was a truly excellent day out. We look forward to the annual return of this very enjoyable community event.